The VR1 Duals are an extension of the VR1 line that further capitalizes on the compact VR1 footprint by using multi-function mechanisms to get two exercises in one machine. These units provide exceptional flexibility and carry with them all of the same line features and benefits that VR1 provides. ENGINEERED FOR VALUE. CYBEX has drawn on its expertise in exercise science and sports medicine to develop a line of strength training equipment that is scientifically engineered to move the way the human body moves. The VR1 line of selectorized products has been value engineered to offer a comprehensive strength conditioning system that fits the space and budget of a wide range of customers. Cybex VR1 line offers users of all levels a high quality experience - promoting correct alignment and proper body mechanics. VR1 is focused on a compact footprint for the space conscious facility as well as intuitive design for exceptional ease of use. The contemporary design is not only elegant but also encloses the weight stack for a less intimidating look that meets ASTM and EN safety standards. The 13-piece line provides a host of options allowing it be customized to meet your facility's needs. 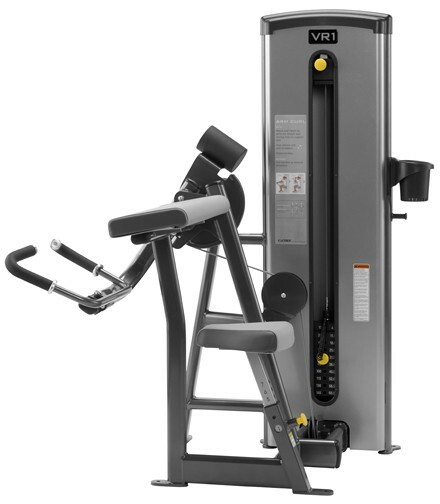 The VR1 Duals are an extension of the VR1 line that further capitalizes on the compact VR1 footprint by using multi-function mechanisms to get two exercises in one machine. These units provide exceptional flexibility and carry with them all of the same line features and benefits that VR1 provides.